Editor's note: The photograph on the right is the once famous Geisberg, which, along with Scharzhofberg and Bockstein (all three in the Saar), was considered one of the best sites in the Mosel wine region at the turn of the 20th century. The re-cultivation of this vineyard is quite spectacular and, as Roman says, "a great sign of the renaissance of German Riesling." Over the years, I have searched out privileged vineyards to add to the ever-increasing Van Volxem portfolio. My focus is on sites that are mentioned in historical documents, such as the Prussian cadastral maps of the Saar and Mosel, as well as price lists from wine merchants, restaurants, and luxury hotels of the 19th and early 20th centuries. I noticed that on the second edition (1890) of Franz Josef Clotten’s 1868 Saar und Mosel Weinbau-Karte that the site of Geisberg, near Ockfen, was rated in the highest tax category. Geisberg was first planted in the Middle Ages by the Benedictine monks of the Abbey of St. Martin in Trier. After the secularization under Napoleon in 1802, the vineyard area was auctioned in Paris. The families Rheinart and Gebert from Ockfen purchased the vineyards and later produced highly prized wines from Geisberg. In the 1890s, which was the golden age of Mosel wine, the hillside of Geisberg was expanded at a great cost. More Riesling vines were planted on the steep slope in 1896. You can even see an old ruin from this period in the vineyard. At the famous Trier wine auctions, between 1893 and 1906, the wines of Geisberg sold for more than either Wehlener or Zeltinger, only Scharzhofberger and Wawerner were consistently more expensive. On the wine lists of luxury hotels from around 1900, the wines of Geisberg were often three times higher in price than those of either Château Lafite or Margaux. The wine crisis on the Mosel, which began in the early 1900s, changed all this. Many of the famous large estates, especially on the Saar, disappeared or reduced their holdings in the steepest vineyard sites. By the 1970s and 1980s, most of Geisberg had no vines. Dominik Völk, the winemaker at Van Volxem, and I decided several weeks ago to re-cultivate this vineyard with our friend and colleague Markus Molitor, one of the best producers in the Middle Mosel but also cultivates vines on the Saar. In the cooler side valley of Geisberg, the conditions are ideal for producing highly aromatic and, at the same time, low-alcohol Saar Riesling wines, especially with all the worries about global warming. The south-facing hillside vineyard of Geisberg is perfectly situated and has a special slate and quartzite-bearing sandstone (so-called Grauwacke, or graywacke), with plenty of water reserves. These aspects are ideal, plus the soil lay fallow for about 25 years. Because we were convinced of the amazing quality potential of this vineyard, we informed the authorities of our intentions in mid-February and contacted in the following weeks about 50 landowners, who had about 150 former parcels on the hillside. 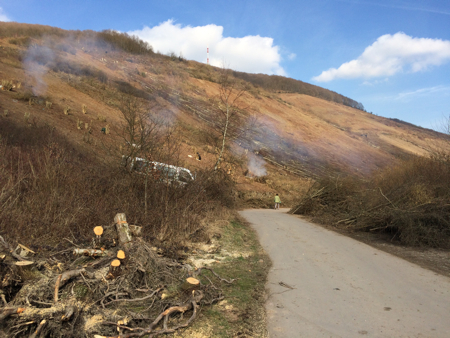 Click here for a link to the photos of the tough work of clearing the slope of trees and shrubs over the last weeks. Afterward, the many dry-wall slate terraces will be refurbished or, if necessary, removed. The work is being done in partnership with the environmental authorities. The new planting of high-quality Riesling vines, by sélection massale, will take place in the spring of 2016. It will be a total of 14 hectares. Translated, from the German, by Lars Carlberg. How exciting to hear from you about another great project. Reminds me in a way of the Goldberg vineyard, based on good scholarship and passion for great Rieslings. I was happy to hear you call Herr Dr. Molitor your friend. He gets little recognition in the US, although he is one of the best there are in Germany, and it’s not at all uncommon to find him helping someone else when he could be promoting himself. If he were a self-promoter, he and his wines would be much better known in the United States as he many times over deserves. I have never tasted a pure Geisberg wine, and I will be impatient till you can market a wine from this site. It seems that this project is not coming complete with very old but usable vines, that much work remains until the first wines will be made. But I hope you will remember us in the United States and make one available to us. John, I agree that the Geisberg project is somewhat similar to Goldberg. In fact, I told Roman a few months ago that these two side-valley sites are his “GGs”—Goldberg on on the left bank, and Geisberg on the right. That’s true about Markus Molitor. He is one of the best winemakers on the Mosel for fine but dense wines. Today, I just translated a text by Roman on the re-cultivation of some plots in Wiltinger Klosterberg. That is largely due to Roman and his friends that this is so about the steep land in Wiltingen. If you knew the town in the time I first was there (1997), the difference is astonishing. In 1997 Wiltingen was a ghost town as far as wine goes, the only vinous experience worth looking for was outside of town, not in it, if you know what I mean. What we owe to all those who hung in there, and those who came later looking for a project worthy of their steel, you and I both know. Roman has played a major role in reviving many different areas of the Saar. OH, by the way, have you decided where the cuttings are coming from? Sadly, I learned that John Trombley passed away on July 25, 2018. I never met him in person before. The news of his death was first posted on Facebook and later on Wine Berserkers. John was a fan of my website. He and I last corresponded in mid-June because he was having problems logging in to my website.